Our son's room is hands down my favorite room in our house. It was the only room in the house where I truly started from scratch -- every single thing was new. It turned out better than I could have ever dreamed -- and was truly a labor of love. We love it -- it is a bright, serene, classic space. A few of you have asked about it here and there, and it is a gorgeous day today, the sun was shining in...so I took some pics of my most favorite room. It is so special to me to share this with you. Sniff. :) Be prepared -- picture overload people!! I. LOVE. THIS. CRIB. It is Gorg! I ordered it from JCPenney's -- it converts to fit a full bed. Part of the reason I decided to share his room with you today is that we are going to convert it into the toddler bed in the very near future. He is ready. Double sniff. That space between the windows is the perfect spot for a window seat, but we may have to hire out for that. For now, the toy box works. The built ins are simply stock cabinets as the base, trim added around the bottom to raise them up, then pine boards as the shelving. Both units were less than $250 to make. Oh yeah, and no Diaper Genie here -- I got cheap towards the end. We use a stainless steel trash can for diapers and it works great. The laundry bag is also from PBK and is perfect -- I just lug it downstairs, dump the clothes in the washer, then put the folded clothes back in to take upstairs. Here's another view of the stripes. It really, really was not hard to do. It takes time, but the effort is minimal. Someday I'll show you how I did it! For more of this room, go here for organization ideas, here for small projects I did to update the space and here for the window treatments (EASY!). P.S. I think I said "here" about 56 times. P.P.S. I think I said "love" about 82 times. I love that room. You did such a great job. I'm sure the big boy room will look just as good! 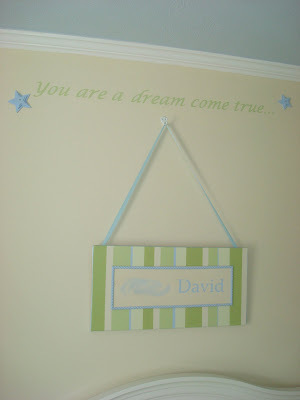 ooohhh if only I had the need for a nursery...so cute! Awww, it's all so sweet. I never think about having another baby until I see adorable nurseries like yours...wait, that sounds little messed up...I would never have a baby just as an excuse to decorate :). Enjoy every moment girl! They aren't kidding when they say it goes fast. Beautiful. That is defiantly a room to be proud of! I am so ready for your spray paint party too. I just started a project and I forgot to take a "before" shot, I am going to stop and take one before I finish it. Luv the colors of your son's room...you did an absolutely stunning job! That room is the sweetest, cutest little thing! I love it. Absolutely love it. I just wanted to tell you "here" that I "love" it! Your baby's room is phenomenal! I only hope to one day have a baby room like that. I am working on flipping my house about now and I am so thankful I found your amazing blog. Thank you for all the wonderful ideas. I too LOVE both of my boys nurseries. It is so hard to convert them to big boy rooms. What a great room!! I (sigh*) am done with all my babies, but I enjoy looking at all of the sweet decorations!! Beautiful colors, love the apple green, I have used this green in my kitchen, and living room...love it! Thanks for sharing, I am sure whatever your next design plan is for the next stage of him becoming a "big boy" will be just as great! What a wonderful room with so many special touches! The nursery is gorgeous. It all works together perfectly! I know how you feel in planning for his big boy room. I just painted over the handpainted airplane mural in my 11 year old son's room. He had outgrown the theme, and is so excited about how his new room is coming together, but it made me sad! WOW!! It's BEAUTIFUL!!! I love it! I can see how very painful it will be to dismantle EDS' room... Hey, how about having another? Then, you can keep both rooms?! :)Kidding... No, really, I would love to see what you do for a girl's room. I have 3 girls! Fabulous! That room is absolutely gorgeous. I love every little thought that you put into it. The stripes on the wall amaze me. I could never get them that straight or perfect. Oh my goodness I love this room too!!! My son is 7 weeks old and we are moving in 3 weeks. I have been so excited to do a really perfect room, and you have inspired me even more. And by the way, our new place has a pantry and I can't wait to do your pantry organizing. I LOVE this room! You did a great job and now I want built ins around my daughter's window! Maybe some day.... right now we're still waiting for her to come! :) And I think I have the same bed - but in cherry! I can see why you are hesitant to change his room...it looks so soothing. I am looking forward to seeing what you decide on for the big boy room since you bought the same picture that I used in my son's room! It has to be my favorite little boy room EVER!!!!! PERFECT, LOVELY, MAGICAL, PEACEFUL....did I say perfect?? I love this room too- It's an ideal nursery! Thanks so much for sharing. That room just says "comfy and relaxed." I love it...such soft colors. Great job! oooo I "love" what you have done "here." giggle. This is a terrific room. Makes me want another baby. Almost. Alright, TOTALLY makes me want another one... but I keep telling myself that they grown up and arent babies forever. Waaaaaaaaa... crap. Now I have to go console myself with chocolate. Such a gorgeous room! I love the colors! Oh, my! His room is so precious and perfect! You did an amazing job and I can tell it was a labor of love! I can see why you love this room so much. You put your heart into it, not to mention sweat equity! I love the black and white photos and the lettering over the plaque. I really like that you painted the ceiling blue. My grandson has the same pony rocker. He sits and watches cartoons while rocking on it. So many details, you thought of everything. Really, this room should be in a magazine. What a wonderful room!!! I love the colors you chose. And the blue ceiling is so great! Also, good job on the built-ins!! I love how you painted the backs of them too. I can tell a lot of "mommy love" went into this adorable room! So cute! Thanks for the photo/frame idea! I'm definitely going to do that! What a gorgeous room! Thank you for sharing that with us, if I had a room like that for my bub I would never want to leave! It looks like it came right out of a catalog. You are so good at this. Excellent ideas. I would like it if you posted step by instructions for the white frames with poster board. thanks for sharing your ideas with us. I can see why it's your favorite~I love it! That green is perfect and I love your idea with the posterboard. Fabulous! It turned out really great! I love the colors! And you were smart to paint the ceiling! I love this room! It's so gorgeous and the green is the perfect color! Beautiful room. They do grow up very quickly, SIGH. Great that you used pieces that can grow with him or be used in other rooms. I love this room. I especially love the built in cabinets and blue ceiling! Love the green stripes & the built-ins. Thanks for the ideas! So sweet. Wow, what lovely serene room. You did a great job decorating, and your Dad !! is he for hire?? I love the room--the colors are so soothing! Perfect for a nursery! What a beautiful room! I LOVE LOVE LOVE the stripes on the walls! Simply darling! I adore it! Children's rooms are my hands-down favorite rooms to decorate! OMG, that is the most beautiful room ever. I'm a green fanatic so I loved how you used the greens and white together. Just beautiful. His room is so cute! I love it! I would have a hard time changing that to make a big boys room too. :( It is adorable! You sons room looks lovely. I bet he loves spending time in there. I can see why this is your favorite room. It is perfect. I love everything about it. I think what is most special about it is that you worked so hard to make it beautiful. Love, love, love it. Am I too old for you to adopt me??? Because I totally want have a room like that for my very own. So perfect! Nice job, you. WOW! His room is fantastic. I think it is pretty obvious why this would be your favorite room! I adore all the green. I also spent a lot of time on my 2 sons' nurseries, and when we moved they were the rooms I missed the most because we transitioned them straight into "big boy" rooms in our new house. Can't wait to see how you make that transition next! LOVE your son's room - you did such a fabulous job!! I just found your blog through This Young House, and I'm so glad I did! I couldn't help it! I've given you an award...just another trophy for your trophy case. Hi, You are a creative genius! That room is one of the cutest I've ever seen. I love all of it!!! Everything...every detail. Thanks for sharing! If you can do that you definately could do a window seat no problem. We are fixing to do one in our Master Bedroom DIY style! Love the stripes...I've also been thinking about doing something smiliar in my boys room on one wall. You may have pushed the inspiration into DO IT! What a beautiful nursery! You did an amazing job putting it all together. The room is beautiful...it is very hard moving on to the "big" boy room. We still haven't (at 6 & 1/2), just keep adding more big boy stuff but can't bear to paint over the moon and sky on the wall or the little people inspired farm scene. I can't wait to learn how to do the stripes. I would like to do them in my daughter's room in shades of....pink of course! oh i just love the ceiling and the stripes!!! I think you would just feel calmer when you walk in the room!!! so beautiful!! Sarah, that room is seriously jaw-droppingly gorgeous. I LOVE everything about it. And guess what? My dining room is apple green from Lowe's, I'm pretty sure it's the same color as your bookcases. I heart that color. What a sweet room! I love all the details! I can't wait to see the new room. I am sure you will love it just as much. The room is precious! I so remember when my son was 3 and moved to a toddler bed! His birthday was bittersweet for me, exciting but sad to see him sleeping lower to ground and around that time the footed pj's were no longer big enough...sigh! Again ICK! could you be any more talented! Just kidding on the ICK part...I'm totally jealous is all! what a lUckY liTtlE bOy you have to live in such a wOnDeRfuL room his mommy made for him ! gorgeous, and thank You for sharing how to make the built ins ! I see WHY it is your fave. room, it's precious, clean, bright, cheerful!!!! You did wonderfully on this project. What a beautiful room. You have a very lucky and loved little boy! I love the room. I need to re-do my boys' room, but I'm scared to stat. I love the stripes, but don't know if I want to take all that time. Love this calendar! Do you know the illustrator??? Fabulous, need I say more? I see why it is your favorite room in the house!! It is so pretty, you did a great job! I could just die I love your room so much. Seriously it's so adorable! Every detail is so sweet and beautiful - what gorgeous style you have! wow, your room is beautiful! It looks like it is out of a magazine and I love the window wall with the shelving! great job! Really room! I love the shelves and frames best, but I love it all. Awesome job! I "love" this "here" baby room. The colors are so pretty. I would be afraid to make a baby room so pretty cause I would never want to change it. EVER! Or you could keep having babies and keep the nursery a little longer. I love your blog!! I'm a new follower now :o) What an adorable nursery! FANTASTIC! I need a thesaurus to put some new adjectives in my comments! But I really do like the calm feeling the room gives, love the antique trike and framed photos on the shelves, and you did a great job on the stripes! Classy! Your nursery is adorable - I love the built-ins and striped walls. I felt the same way about transitioning from nursery to big girl, so we kept everything and added a new bed & bedding. It made mama feel better! Hi Sarah! I remember you from RMS. I went to rocks a couple of times, but not much. I remember this adorable nursery. Good to hear form you! I'm following you now so I can keep coming back. I just recently found your blog and I lurve it! However, something is driving me crazy: What do the "big honking letters" in your son's room spell? Please let me know before I die of curiousity! BTW, his room is adorable! Thanks! I love the color scheme! I am stealing it for my baby girl's room. I love the different greens. Instead of the blue ceiling, I'm going to go with a light lilac color. I was so excited to come across your nursery post because I wanted to avoid the stereotypical pink room that I have a feeling I would have done instead!